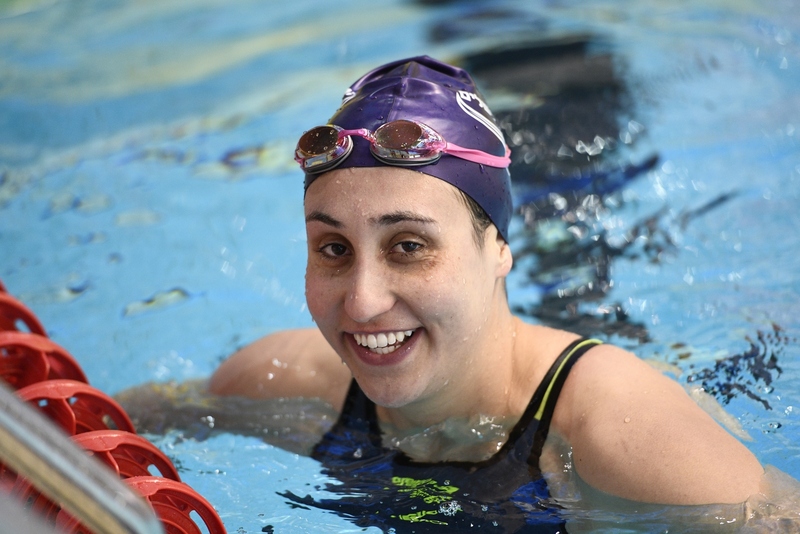 Andrea Murez’s swimming journey began in California and took her to Israel. Now she is on her way to swim in the Rio Olympics. Andrea Murez stands on the starting block at one end of the Olympic-size pool in Israel’s Wingate Institute in Netanya and then springs feet-first into the water. After a big splash, she begins to swim freestyle, her best stroke. It takes her about 46 seconds to complete one length of the 50-meter pool. But this is just practice—her second of the day. In April 2015, at Israel’s Swimming Cup, she swam the same distance nearly twice as fast: 25.12 seconds, breaking the national record. It also qualified her for the 2016 Summer Olympics in Rio de Janeiro. Like most athletes who have earned a place on an Olympic team, Murez worked long and hard to get there. Now 24 years old, she has been swimming pretty much every day since she was seven, dedicating much of her life to the sport and hoping to one day swim in the Olympics. It didn’t just take years of swimming to get to this point; Murez also had to move to Israel, where competition for a spot on the Olympic team is less intense than in her native United States. Under the Law of Return, she automatically gained Israeli citizenship, and switched her sports citizenship for international competitions from American to Israeli. This year’s Israeli Olympic team is composed of 47 athletes who will compete in 16 sports. It is by far the largest delegation the country has sent to the games since it first competed in 1952, just four years after the state was established. Given its small size and relatively short history, Israel has never been an Olympic powerhouse. It was not until 1992 that an Israeli athlete took home a medal, when Yael Arad won silver in judo at the Barcelona games. Since then, Israeli athletes have won six more medals, including one gold in windsurfing. Rather than medals, Israel’s Olympic legacy is often associated with the 11 athletes and coaches who were killed in a Palestinian terrorist atrocity at the Munich games in 1972. The memory of this event and its victims continues to both haunt and inspire the Olympics today. All Israeli Olympic athletes visit a memorial to the victims, located in Tel Aviv, before departing for the games. The Olympic Committee of Israel is also organizing a memorial service during the games in Rio, which will be attended by international dignitaries, including the head of the International Olympic Committee and Brazilian government officials. The Olympics, like much in Israel, are a combination of a traumatic past and the quest for a brighter future. A related but lesser-known facet of Israeli Olympic dreams is embodied in the story of Murez: The role immigrants play in Israel’s still-emerging sports scene. Of the 47 athletes competing in the Rio games, 10 were born outside of Israel. Most of the members of the 2014 Winter Olympics team were born in countries like Ukraine, the United States, and Belgium, where the colder climate makes sports like ice-skating and skiing much more common. This is not a new phenomenon. Immigrants have long played a part in Israel’s Olympic teams, as they do in many aspects of life here. In fact, at least two of the victims of the 1972 Munich massacre were immigrants, including David Berger, a weightlifter born and raised in the United States. Murez has been an accomplished swimmer since she was a kid growing up in Venice Beach, California as a member of the small Team Santa Monica, a club associated with USA Swimming. She began to take swimming seriously when she was 12, and realized just how fast she was when she began making the cut-off times in various elite youth competitions around the United States. First she qualified for Speedo Sectionals, a prestigious regional competition, then the national championships when she was 15. At 16, she swam in the U.S. Olympic trials, but did not earn a place on the team for the 2008 Games in Beijing. She attended Stanford University on a swimming scholarship, where she also studied biology as part of a pre-medical school track. “I was the slowest person in my class,” she recalls. “But everyone there helped make me better; then eventually I became one of the faster ones.” As “one of the faster ones,” she was named a NCAA All-American three times and was a member of two national championship-winning freestyle relay teams. But when she finished Stanford, she had to make a choice: Give up competitive swimming; keep training with a club team in the United States; or immigrate to Israel, where a smaller pool of athletes makes it easier to earn a place on an Olympic team. She chose the third option. And having been originally taught to swim by her grandfather, who was part of the emerging Zionist youth sports scene in Europe in the 1930s and narrowly escaped the Holocaust by fleeing his native Vienna just before the outbreak of World War II, one could say representing Israel at the Olympics is somehow in her blood. Her father, Jim, certainly thinks so. “The fact that she is representing Israel is amazing,” he says. When Jim’s father, Joe Murez, was a teenager in Vienna in the 1930s, he swam for HaKoach, the most well-known of a number of Jewish sports clubs that sprang up around Europe, where Jews were often banned from mainstream athletic clubs. “He often told stories of being beaten up by Nazi kids on the way home from swim practice,” Jim says. Joe fled Austria and immigrated to the United States in 1938. In return for his automatically-granted U.S. citizenship, he served in the American army’s intelligence corps, putting his knowledge of multiple European languages to work helping his new country defeat Nazi Germany. When Andrea Murez was born in 1992, Joe lived in a Venice Beach condo with a swimming pool, where Andrea and her older brother, Zachary, who went on to swim for Yale University, often visited. “Until she was four years old, Andi would not get off the steps of the swimming pool,” her father recalled. “She was just so afraid of the water. But my father, who was so gentle and kind, had a way of working with her, trying to get her to go further out in the water. Once she became comfortable enough to splash around, there was no holding her back.” The lessons with her grandfather, as well as meeting a local swim coach during a municipal junior lifeguard camp at her local beach, led her and her older brother to join a swim team later when she was seven. Murez also remembers her grandfather teaching her how to swim, and laughs when she recalls that at one time she was afraid of water. But it is also her grandfather who first got her interested in Israel. “He was always talking about Israel, and was involved in several organizations supporting Israel,” she says. As a teenager, she became interested in his stories of life as a Jewish athlete in Europe. She also watched her brother win 10 medals in the 2003 Pan-American Maccabi Games, an international competition for Jewish athletes sponsored by the Latin American Maccabi Confederation. Murez was impatient for the day when she would be old enough to swim in a Maccabi competition. That day finally came in 2009, when she and her brother both traveled to Israel to compete for the United States in the Maccabiah, which since 1932 has been held every four years and is the world’s third-largest sporting event after the Olympics and the Pan-American Games. Joe Murez, then 90, came to Israel to watch his grandchildren swim. He died a year later. At the time, she turned down Israeli coaches’ suggestions that she immigrate to Israel to swim. But she kept the idea in the back of her mind while she went on to finish college. 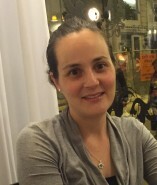 When she returned for the 2013 Maccabiah, the idea of immigrating to Israel came up again. Again she put it off, this time so she could complete medical school entrance exams. Finally, in the winter of 2014, she moved here. She now lives ten time zones east of California, in a dorm at the Wingate Institute. The institute’s campus is full of palm trees and gardens, and overlooks the Mediterranean Sea. The Wingate pool is where Israel’s national swim team trains, including the six members who are competing at this summer’s Olympics. But Israel has sent swimmers to the Olympics every year since it began competing in the games. The first swimmer to compete for Israel was Nachum Buch, who swam the 100-meter freestyle at the 1952 games in Helsinki. He was among the slower finishers at 1:05:60—a time that today would not even qualify for competition. Buch went on to coach the national team for a number of years. Israeli swimmers have yet to win any medals at the Olympics, but in recent years the country’s swimming program and talent pool have been growing, the national swim coaches say. 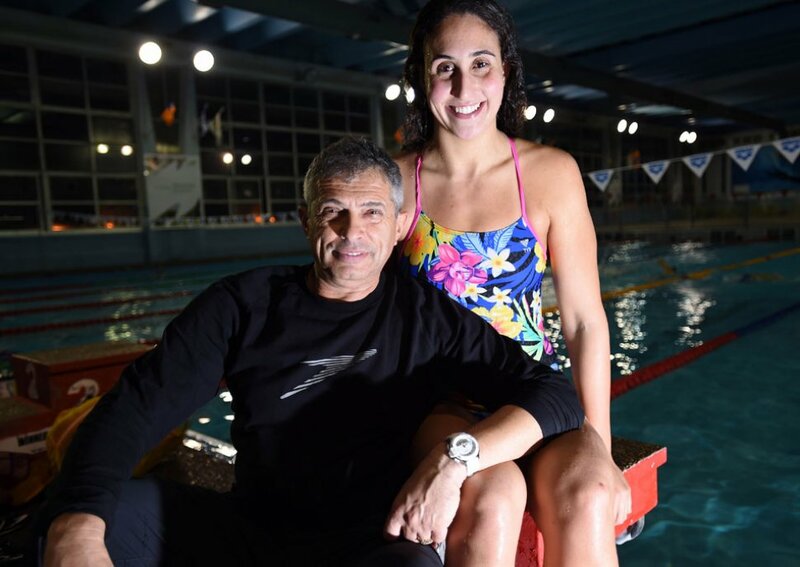 More youth are joining teams, and the coaches attribute this partly to Israel’s hosting the 2015 European Short Course Championships, the first major international swim meet held in the Jewish state. That competition, along with the new pool the Wingate Institute opened in 2013, has brought increased attention to and interest in competitive swimming in Israel. The national team has also passed some recent milestones, bringing increased attention from the Israeli media. Four years ago, the team won five medals at the European championships in Hungary. This year, Israel sent its largest team ever—27 swimmers—to the European championships in London. Andrea Murez and national team coach Leonid Kaufman. Photo: Bernie Ardov / Walla! Kaufman said he hopes Murez will help Israel’s swim team make more history at the Rio Olympics. 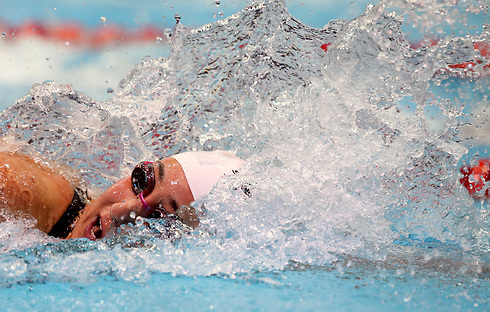 The team’s goal is for Murez to make the semi-final in either the 50- or 100- meter freestyle races, meaning that she will place in the top 16 of a pool of more than 50 swimmers. Achieving this is far from certain, but it is doable, he says. Only one other female Israeli swimmer has made the Olympic semifinals: Amit Ivry, who placed 13th in the 200-meter individual medley at the 2012 games in London. Ivry is on this year’s team as well, and will swim the 100-meter breaststroke. Another member of this year’s team, Yakov Toumarkin, has recorded Israel’s best-ever Olympic finish in swimming, placing seventh in the 200-meter backstroke in London. Toumarkin will swim that event, along with two others, in Rio. Kaufman is an immigrant from Russia, and his involvement is not unusual. Immigrants have long been among Israel’s top athletes. Every few years, one or two Jewish-American swimmers join the Israeli team hoping to make the Olympics, coach Sterling says. But only one other U.S.-born swimmer, Dan Kutler, has actually gone on to swim in the Olympics for Israel. Kutler, also from California, swam on a four-man Israeli relay team at the 1996 Olympic Games in Atlanta, helping them finish eighth. This practice of switching countries in order to further one’s athletic ambitions has been increasingly criticized in recent years. “The question of changing citizenship to compete in the Olympics is neither straightforward nor does it have a simple answer,” Penn State professor Colleen English wrote in an academic paper before the 2010 Winter Olympics. The preliminary heats and semifinals of the women’s 100-meter freestyle will take place on August 10, with the finals on August 11. The preliminary heats and semifinals of the women’s 50-meter freestyle will take place on August 12, with the finals on August 13.